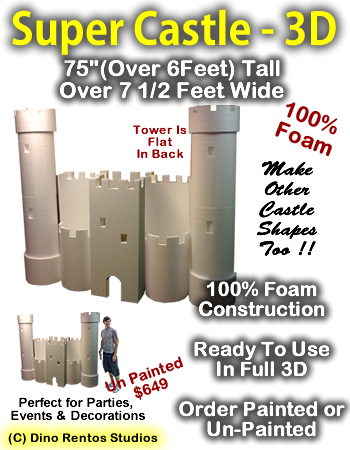 Giant Super Castle 3D Foam Prop - 6 Foot by 7 Foot - Dino Rentos Studios, INC. Perfect decoration for any event, party or display. Can also be used as decoration for kid's room or as a fun play toy! Though it is flat in the back, the castle is a whopping 7 feet long and 6 feet tall. Order multiple castle prop kits to make a larger castle display. Order it fully painted, ready to use, or unpainted so you can paint it as a project. Add a rock mountian under the castle (not shown). Adds 12" to the height. Upgrade to Hard Coated so it feels and looks like Rock. Comes with extra sturdy box for storage. Call for pricing on multiple quantity and savings on shipping.